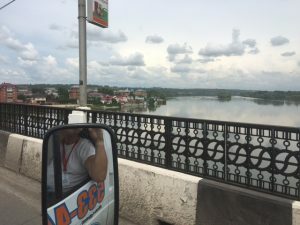 Our driver smoked, had incredibly bad taste in Russian pop and seemed near to dozing off while driving the 6 or 7 hours to Novosibirsk – but was very nice and very cheerful. Matt and I sat up front in the cramped cab though the music alone was enough to suggest sitting in the car would have been a better bet. En route we were working out our options. While Matt sought advice from the mechanics and his very mechanically minded father in the UK, I started searching for parts supplies. 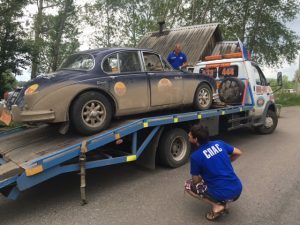 Jaguar (Russia) had absolutely no interest but this was not a massive surprise as dealers for luxury marques generally have little interest in their historic models. Not a great sales image to my mind. I did not expect them to stock a gearbox for a MkII but some assistance in pointing us in the right direction would have been nice. I then emailed Jaguar Club Russia and a lengthly email conversation followed with Gareth. Lots of helpful advice and a kind offer to drop everything and fly out (from France) to Novosibirsk with the parts the next day. Unfortunately despite Gareth assessing the damage from afar we could not know what to suggest he brought until we got to Novo and got the car on the ramp. Also we had been told that the mechanics in Novo were amazing and could invent solutions and pull newly created or repaired parts out of thin air. There is (or certainly was) an element of this particular rally that relies on a bit of bodging up and carrying on, though I am guessing that we are not far from this becoming whole engines flown in to a Mongolian camp site by helicopter.So while we appreciated the offer of (and still may need) anything we needed flown in we had to see what could be done in Novo first. Also IF they could fix it we may not lose time and we may be able to start on Day 15 – if we wait for flights and new parts we may lose a day or two. Of course, if they can’t fix it we may lose a lot more than a day or two. Once we get to BOSService we see quite a few P2P cars already there and we are told that we will have to wait until the morning for a ramp – so off to the Marriott, a beer and a shower – today was more tiring than driving. At least we got our first mention in the official ERA blog – like the news, misfortune sells.